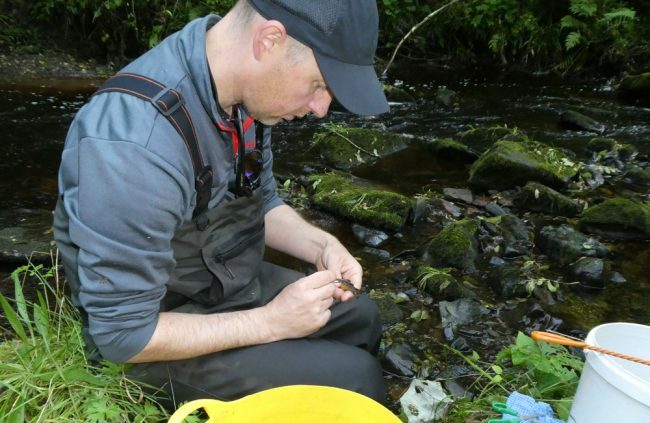 As many readers will be aware, MSS were criticised by biologists around the country for not having included local electrofishing data into the decision making process when determining Conservation status and the subsequent Conservation Measures for salmon rivers in Scotland. There were reasons whey MSS felt they couldn’t include ours and other’s data but at least now they have come up with a strategy that will take local fish populations into consideration. A Government picked site on the upper Ayr. We’ve know for years that this area is impacted and productivity limited due to enriched mine water discharges and groundwater rebound from the post industrial developments nearby. Mining has ended but the legacy prevails and may do for decades. However, MSS have developed a protocol for surveying to ensure that local biologists don’t influence results. We’ve been contracted to gather data from 30 randomly selected sites across Ayrshire. MSS used a computer model to determine where we should fish. This doesn’t appear to take account of any habitat limitations such as depth, substrates etc., so until we visit sites, we really don’t know what to expect unless of course we have surveyed these locations previously. 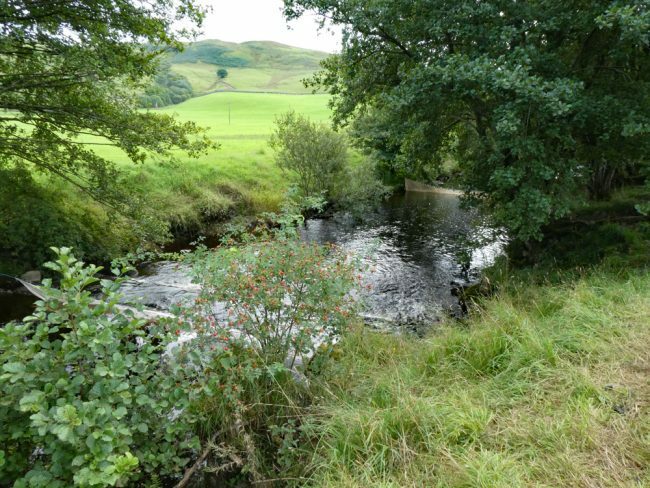 With that said, our knowledge of local watercourses is extensive built up over our 20 or so years in existence and we are pretty much certain that we can predict the sort of results to expect in each given site before we get there. So far at least, we’ve been unsurprised by any results. Quite how MSS will interpret these data will be interesting and we look forwards to seeing their analysis. A deep water site in pool habitat on the Upper Girvan. This area of the Girvan has good water quality although the habitat has been modified historically. We don’t see any scope for fully assessing habitat in the survey protocol. Perhaps habitat is not that important??? It is to us and the fish and will remain so. Where we find the MSS protocols challenging is when we are required to fish deep water sites. So far, all have been fishable but some only just. This is hardly typical of traditional survey design that targets spawning and juvenile habitat. 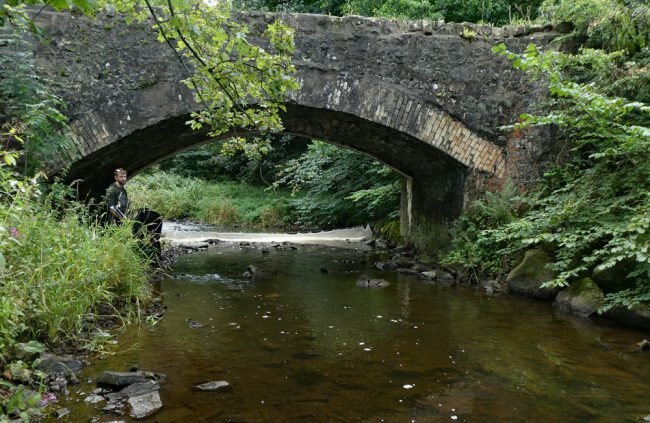 Other challenges include electrical conductivity….which in Ayrshire is generally much higher than most northern rivers due primarily to mine water discharges and agricultural diffuse pollution but also other things. The problem we have with high conductivity is that it drains our batteries quickly. Couple this with deep water sites and suddenly we find our batteries discharging at an alarming rate. Electrical conductivity of water is determined by dissolved nutrients in the water…you can’t see them but where pollution of this nature enters the rivers and burns, electrical conductivity soars. Mine discharges in particular raise electrical conductivity and nutrients, often to worrying high levels. 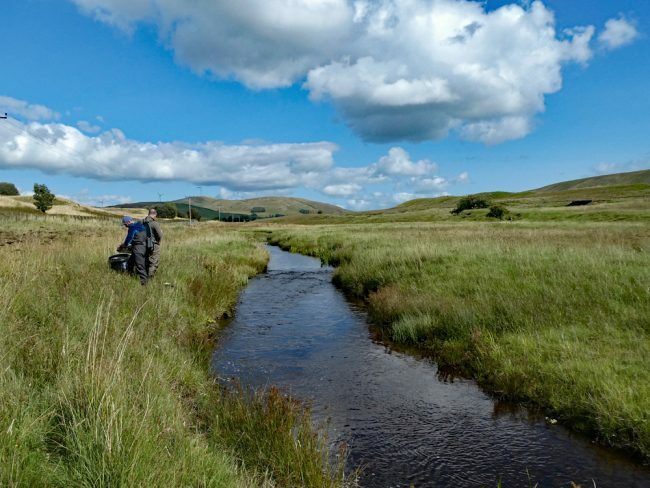 I remember Gillian and I blew the fuses on our bank-side equipment several years ago when fishing a burn with conductivity of over 2000 micro Siemens /sqcm (in contrast, a clean wee burn in the hills around Loch Doon may measure 15 micro Siemens /sqcm). These excessively enriched discharges impact on habitat and limit spawning success. It is the nutrient levels that cause the problems rather than the electrical conductivity of water but that is how we measure it and set our equipment up in order not to damage fish. Many of the sites selected for our survey for the National monitoring programme suffer from high conductivity and enrichment but these are the limiting factors we see and face across Ayrshire. Enrichment can increase productivity but excessive enrichment generally results in depleted fish stocks…exactly what we are facing in some areas. A site on the Carmel Water in the Irvine catchment where silt impacts both habitat and spawning success. It was a good site for eels though. We are well underway with this survey and the data generated will be interesting. Additional sampling of water quality, scale and genetic samples will help bring clarity to some of the uncertainties we faced previously. We are particularly keen to see the water chemistry results once analysed as this is an area where we feel most problems may be identified. Lets hope that on the back of this research, funding can be allocated from Government that addresses any problems rather than merely identifying them. Muir taking scale and then genetic samples from parr.